We are a leading Manufacturer of latest oxygen vol-03 rangoli georgette kurtis, rebel designer short kurtis, georgette kurtis, printed kurti, ladies kurtis and indian kurtis from Surat, India. 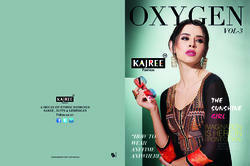 FeaturesMOQ : Only Full CatalogueCatalogue : Oxygen vol-03Full Set Price: 4490/- INRFull Set : 10 Pcs. We are the supplier of the Rebel Designer Short Kurtis to our clients. This straight cut kurti embellished with embroidery on neck and printed work which give comply look in your every casual, party, college, office occasion. This kurti comes with shantoon fabric inner and available in L, XL and XXL sizes. Full Set : 11 pieces. Inspired by the current market trends, we have also come out with a designer and attractive collection of Tunic Kurti. The offered tunic kurti is designed utilizing the optimum quality fabric and advanced techniques as per the trends of market. This tunic kurti has beautiful neck designs and are in attractive color combinations. We offer all regular and extra sizes and also available at most competitive prices. Full Set : 12 Piece. 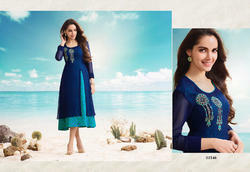 We are offeringEmbroidered Georgette Kurtis to our valuable customers while keeping in mind their demand. We offer product to meet the satisfaction of customers by our best product. We are offering Party Wear Kurti to our valuable customers while keeping in mind their demand. We offer product to meet the satisfaction of customers by our best product.